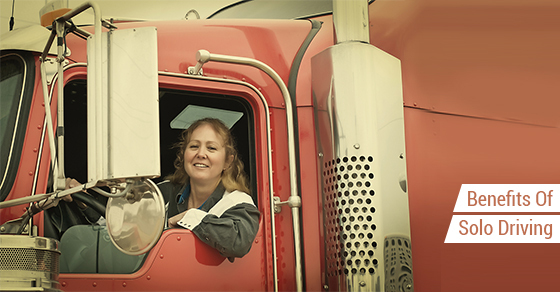 Whether you’ve recently decided to become a truck driver or have been exploring the great North American roads while hauling a trailer for decades, it’s always refreshing to get a new perspective on the benefits of a solo trucking career. Although there are thousands of people who choose to drive in a fleet as a part of a team, there are distinct advantages to exploring the open road on your own. As a truck driver, the cab is your personal space. You keep your clothes here, food, blankets, and will likely sleep there during the majority of nights while on long hauls. It’s your home away from home, and inviting someone into it can be hard for certain people. When you ride with a partner, you have to separate the space available, create boundaries and rules so that you are not getting in each other’s ways or on one another’s nerves, and ensure that your personal habits aren’t annoying the one you’re with. Often times having someone else in the cab with you is like up-keeping a relationship that you never get a break from, which can be overwhelming to some drivers. Driving with a partner has the advantage of allowing for longer trips since a second driver allows you to split up the duties and safely travel further distances without having to stop the truck. Of course, when you have a partner you will be expected by most companies to take on these longer shifts. When going solo, it’s dangerous to take jobs that require immediate travel cross country, which will lead to getting booked for shorter trips; allowing you more time at home with your family. Living with someone takes time to get used to because everyone has their own patterns and styles. If you’re both clean people that enjoy order in your living space, then a partnership could be great. Unfortunately the reverse can be said if you are opposites. Driving alone completely avoids this issue, because no matter how you choose to keep your cabin or your lifestyle on the road, you’ll only have yourself to deal with. This can also work for when you want to take breaks, stretch your legs, or for making decisions on what routes you decide to take. When you’re planning a trip, you have to plan several days in advance. Will you be gone for three days, or five? You’re not sure until you find out where you’ll be going. Working with a partner means finding a time when both of you can work together. That also breaks down to how much the two of you want to work. A workaholic would be happy to work every day of the week, but others may only want to work a few days on and then a few off. The solo driver makes their schedule without a concern for anyone else. They work when they want and stop when they’re tired without worrying if someone else will be okay with their schedule. Whether you have a partner or are hitting the open road alone, a trucker’s job all starts with having the right equipment. Contact our team today to discuss the latest options in truck leases.